Learn how to create new pages using page blocks or a page template. With Zipify Pages, there are 2 options available for adding a new page. Use one of our pre-built conversion tested page Templates constructed with page blocks. Click on the "NEW PAGE" button when on the app's Pages dashboard. You'll then be presented with the Page Templates library. "Blank Page" is selected by default, so just click the "Create Blank Page" button in the top-right corner. 2. Enter the Page Name and Add Tags. Enter the page name into the Page Name field (required). 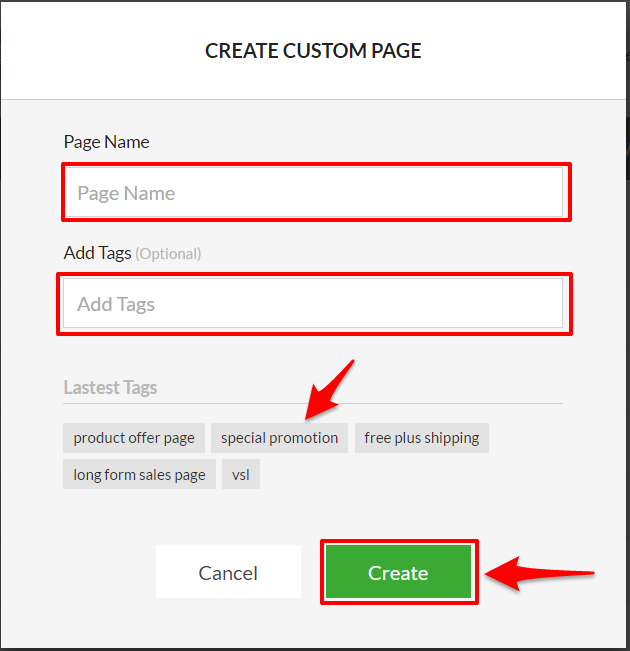 Add any page tags that you would like the page to use (optional). To add tags (up to 10 per page), enter the tag name and then press the comma key on your keyboard and the tag will be added below the "Add Tags" field. Below that it will also show the 5 most recently used tags. Click on any of those tags to add them to the page. 3. Click the "Create" button to create the page. You will then be directed the "Page Constructor Interface" to start building out your page. Click on the "NEW PAGE" button when on the app's Pages dashboard. You'll then be presented with the Page Templates library. NOTE: The template title gives you an idea of what this type of page can be used for in your business. New templates will be added to our template library continuously so check the templates available regularly! 3. Once you find the Template you want to use, click the "Use Template" button in the top-right corner. The "New Page" popup will appear where you can enter the Page Name and Add Tags. Enter your page's name into the Page Name field (required). The selected page template's title will automatically be added to this field, but you can change the name to whatever name you'd like to use. Add any page tags that you would like the page to use (optional). Pre-defined page tags will be added depending on which page template you've selected. To add additional tags (up to 10 per page), enter the tag name and then press the comma key on your keyboard and the tag will be added below the "Add Tags" field. Below that will also show the 5 most recently used tags. Click on any of those tags to add them to the page. Edit the page by replacing the placeholder images/texts/videos/products with your own. You can also add more blocks or rearrange the existing blocks if desired.